Behaviorism is a school of thought in psychology based on the assumption that learning occurs through interactions with the environment.  Behaviorists believe that our responses to environmental stimuli shape our behaviors.  environment shapes our behavior and taking internal mental states such as thoughts, feelings and emotions is useless in explaining behavior. 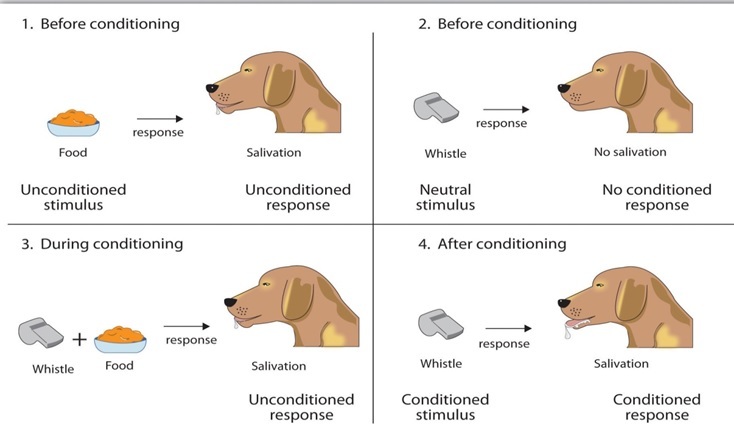  Classical conditioning uses reflexive behavior - behavior that occurs as an automatic response to some stimulus.  Operant conditioning is a method of learning that occurs through rewards and punishments for behavior. Behaviorism had it's earliest start with the work of a Russian physiologist named as Ivan Pavlov. First he did research on the digestive systems of dogs led to his discovery of the classical conditioning process, which demonstrated that behaviors could be learned through conditioned associations. 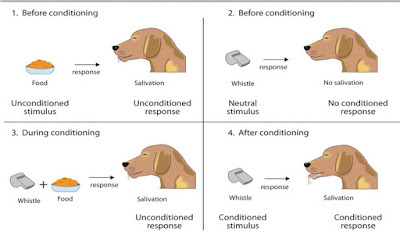 In order to understand how classical conditioning works, it is important to be familiar with the basic principles of the process. There are five principles of classical conditioning. Acquisition is the initial stage of learning when a response is first established and gradually strengthened. For example, imagine that you are conditioning a dog to salivate in response to the sound of a bell. Once the response has been acquired, you can gradually reinforce the salivation response to make sure the behavior is well learned. Extinction is when the occurrences of a conditioned response decrease or disappear. In classical conditioning, this happens when a conditioned stimulus is no longer paired with an unconditioned stimulus.  These techniques are also useful in the treatment of phobias or anxiety problems.  Teachers are able to apply classical conditioning in the class by creating a positive classroom environment to help students overcome anxiety or fear.  A box often used in operant conditioning of animals; it limits the available responses and thus increases the likelihood that the desired response will occur. 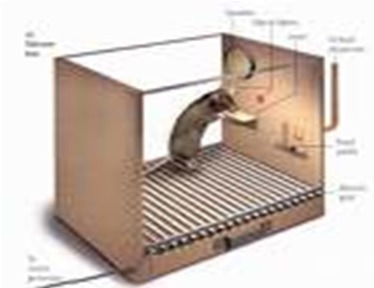  Place a rat in a special cage (called a “Skinner box”) that has a bar or pedal on one wall that, when pressed, causes a little mechanism to release a food pellet into the cage.  The rat is moving around the cage when it accidentally presses the bar and, as a result of pressing the bar, a food pellet falls into the cage.  The operant is the behavior just prior to the reinforce, which is the food pellet. In a relatively short period of time the rat "learns" to press the bar whenever it wants food.  This leads to one of the principles of operant conditioning.  A behavior followed by a reinforcing stimulus results in an increased probability of that behavior occurring in the future.  If the rat presses the bar and continually does not get food, the behavior becomes extinguished.  if you turn the pellet machine back on, so that pressing the bar again provides the rat with pellets, the behavior of bar-pushing will come right back into existence, much more quickly than it took for the rat to learn the behavior the first time. 2)Negative reinforcement take away an unpleasant stimulus when the operant response is made. For example, stop shocking a rat when it presses the lever. 1) Positive: presentation of an aversive stimulus to decrease the probability of an operant response occurring again. For example, a child reaches for a cookie before dinner, and you slap his hand. 2) Negative : the removal of a pleasant stimulus to decrease the probability of an operant response occurring again. For example, each time a child says a curse word, you remove one dollar from his piggy bank.  Classical and operant conditioning are two important concepts central to behavioral psychology.  While both result in learning, the processes are quite different. Today, both classical and operant conditioning are utilized for a variety of purposes by teachers, parents, psychologists, animal trainers and many others. In animal training, a trainer might utilize classical conditioning by repeatedly pairing the sound of a bell with the taste of food. Eventually, the sound of the bell alone will begin to produce the same response that the taste of food would. In a classroom setting, a teacher might utilize operant conditioning by offering chocolate as rewards for good behavior. Students can then turn in these chocolate to receive some type of reward such as treat or extra play time.  Many critics argue that behaviorism is a one-dimensional approach to understanding human behavior and that behavioral theories do not account for free will and internal influences such as moods, thoughts and feelings.  Behaviorism does not account for other types of learning, especially learning that occurs without the use of reinforcement and punishment.  People and animals are able to adapt their behavior when new information is introduced, even if a previous behavior pattern has been established through reinforcement.  Behaviorism is based upon observable behaviors, so it is easier to quantify and collect data and information when conducting research.  Effective therapeutic techniques such as intensive behavioral intervention, behavior analysis, token economies and discrete trial training are all rooted in behaviorism. These approaches are often very useful in changing harmful behaviors in both children and adults. Behaviorism is not as dominant today as it was during the middle of the 20th century; it still remains an influential force in psychology. Outside of psychology, animal trainers, parents, teachers and many others make use of basic behavioral principles to help teach new behaviors and discourage unwanted ones.